Power and connect your compatible Garmin echoMAP/echoMAP CHIRP 40, 50, 70, 80, 90 series or STRIKER 4, 5, 7 series with this 4-pin power/data cable. The cable includes 6 feet (1.82 metres) length of cabling and also features NMEA 0183 inputs/output. Compatibility: Compatible with Garmin echoMAP 43dv, 44dv, 45dv, 52dv, 53dv, 54dv, 55dv, 72dv, 72sv, 73dv, 73sv, 74dv, 74sv, 75sv, 82sv, 92sv, 93sv, 94sv, 95sv, echoMAP CHIRP 42dv, 43dv, 44dv, 45dv, 52dv, 53dv, 54dv, 55dv, ECHOMAP Plus, 45cv, 65cv, GPS 158/158i, STRIKER 4, 4cv, 4dv, 5dv, 7dv, 7sv, STRIKER Plus 4, 4cv, 5cv, 7cv, 7sv, 9sv. Power and connect your compatible Garmin echoMAP/echoMAP CHIRP 40, 50, 70, 80, 90 series, STRIKER 4, 5, 7 series or STRIKER Plus 4, 5, 7, 9 series with this 4-pin power/data cable. The cable includes 6 feet (1.82 metres) length of cabling and also features NMEA 0183 inputs/output. If you'd like to add Garmin marine BlueCharts to your Garmin compatible echoMAP, echoMAP CHIRP or STRIKER chartplotter you can do just that by buying and loading Garmin BlueCharts. The charts come preloaded on microSD card together with a SD card adaptor. Simply insert the SD card into your Garmin echoMAP/STRIKER and you are ready to sail, cruise, etc, with the latest nautical Garmin charts. ‣Garmin 4-pin power/data cable with 6 feet (1.82 metres) of cabling. 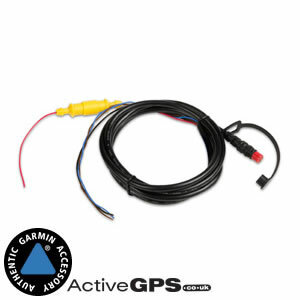 What is the Garmin 4-pin power and data cable compatible with? Garmin echoMAP 43dv, 44dv, 45dv, 52dv, 53dv, 54dv, 55dv, 72dv, 72sv, 73dv, 73sv, 74dv, 74sv, 75sv, 82sv, 92sv, 93sv, 94sv, 95sv, echoMAP CHIRP 42dv, 43dv, 44dv, 45dv, 52dv, 53dv, 54dv, 55dv, ECHOMAP Plus, 45cv, 65cv, GPS 158/158i, STRIKER 4, 4cv, 4dv, 5dv, 7dv, 7sv, STRIKER Plus 4, 4cv, 5cv, 7cv, 7sv, 9sv. Was it another Garmin marine accessory, part or BlueChart? If it was click the following links to find your models accessories or BlueCharts maps. Alternatively if you have a question about the Garmin 4-pin power/data power cable our contact page is the place to go to ask us a question.